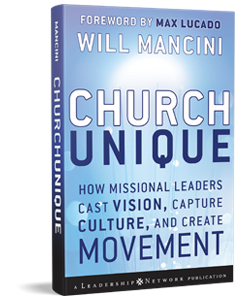 Church Unique was written by church consultant Will Mancini, an expert on a new kind of visioning process to help churches develop a stunningly unique model of ministry that leads to redemptive movement. He guides churches away from an internal focus to emphasize participation in their community and surrounding culture. In this important book, Mancini offers an approach for rethinking what it means to lead with clarity as a visionary. Mancini explains that each church has a culture that reflects its particular values, thoughts, attitudes, and actions and shows how church leaders can unlock their church's individual DNA and unleash their congregation's one-of-a-kind potential. Mancini's work in the book is exemplified through the consulting work of Auxano, which helps church leaders create a Vision Framing Process. Mancini explores the pitfalls churches often fall into in their attempt to grow, such as adding more programs, using outdated forms of strategic planning, or adopting the latest conference technique. He explores a new model for vision casting and church growth that has been tested with leaders in all kinds of congregations, including mainline, evangelical, nondenominational, and all sizes from church plants of a few hundred to multi-site congregations of tens of thousands. The practices and ideas outlined in Church Unique will help leaders develop missional teams, articulate unique strategies, unpack the baggage of institutionalism, and live fully into their vision. Whether leading a megachurch or a church plant, a multi-site or a mainline, a ministry or parachurch, Church Unique will provide inspiration as a practical guide for leading into the future.